On December 10, 2012 The New York Times reported on how The National Intelligence Council (NIC) expects the world to change over the next seventeen years. By 2030 Asia will be well on its way to returning to being the world’s powerhouse, just as it was before 1500. By 2030, majorities in most countries will be middle-class, not poor, which was the condition of most people throughout human history. 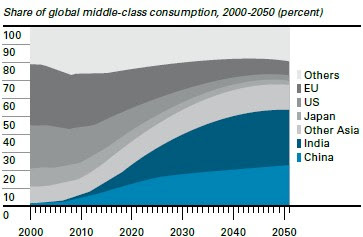 Below is a chart depicting the percent of total world consumption of the middle class from the year 2000 to 2050. The countries in blue are India and China. The impact on consumption by Europe and the United States is on the decline. 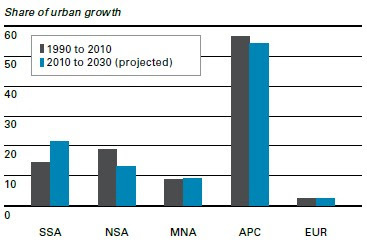 those projected during the next two decades (2010 to 2030). If you desire to have your children to have a good life economically in 2030 and beyond, have them focus on meeting the needs of Asia.